“I dearly love a laugh,” says Elizabeth Bennet. As do I, though it takes a very good book to make me do so. 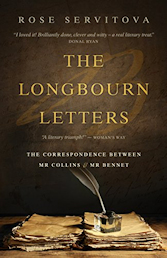 One such book is Rose Servitova’s The Longbourn Letters, which mirrors the warmth, inventiveness and humour of Miss Austen in an extended correspondence between Pride and Prejudice’s Mr Bennet and Mr Collins. Given we both wrote books sharing the same protagonist, Rose and I eventually connected and I’m delighted she agreed to answer a few questions about her creative process, how to write humour, and her love of Jane Austen’s works. 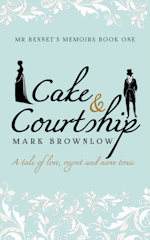 Q: An epistolary novel featuring two of Jane Austen’s minor characters – how did that all come about? Minor characters are often main characters who just haven’t had their limelight yet. It was originally to be Mr Collins’s diary but when I tried to write it, it was dreadful – all one-side pomposity. I knew I needed someone to work opposite him, to bring out the best in Mr Collins and when I considered Mr Bennet’s razor-sharp wit and how four letters already existed between the two men in Pride & Prejudice, I knew I’d found my angle. The stage was already set and all I had to do was fill in the gaps between the letters that already existed and continue beyond the end of Pride & Prejudice. They are two of my favourite characters in fiction and it felt like an honour to give them the platform to speak and show themselves to the world in their true magnificence. Q: There’s been quite a lot of buzz around men’s ability (or not) to write accurately from a female point of view. Were there any special challenges to writing a novel with two male protagonists? It was alarmingly easy to get inside these two men’s heads and, possibly, that is because the content is so light. I have loved Mr Bennet and Mr Collins for years and feel I know them intimately and how they might react in any situation (as I would Lady Catherine de Bourgh or Mrs Bennet). There are many things that I am so glad that I did not know before starting this novel or they would have hindered my progress; the unpopularity of, and apparent difficulty in, writing in the epistolary form for one (which I found worked well for me) and the male/female perspective debate. Ignorance can be bliss. The content and subject matter of the letters were the concerns of two men of the lower gentry in the Georgian period, as I would envision them to be but I feel that the sentiment and poignancy are universal and could come from either male or female perspective. Q: Mr Bennet and Mr Collins are responsible for a lot of the humour within Pride and Prejudice and The Longbourn Letters is also filled with similar charm and wit. How difficult is it to write amusing prose and know what is going to be funny to the reader? I write the books to amuse myself and that is my only gauge. I truly believe that if I find the prose amusing then others will too. I have no other way of knowing. My sister is not an Austen fan and I let her read The Longbourn Letters before going to print. I had described it as a humourous title and she was shocked – she felt that if a book was to be described as funny it should be a laugh-a-minute, slap-your-knee, hilarious read. For a few minutes, I started to doubt my own ability to deliver witty prose but I sent it off anyway. Thankfully, the general public fell down on my side. With regards, making prose humourous, I think it has to come naturally and subtly. If the characters are humourous and you really know them very well, their dialogue and shenanigans will be funny – it should be a natural fit. Q: Your next novel is a continuation of “The Watsons”. How has the writing process (a “continuation”) differed for you from The Longbourn Letters? The Longbourn Letters almost felt easy and accidental and I wondered how I’d ever get that lucky again. I felt I had to get more technical for The Watsons – there had to be stages, character development etc… and I hate being technical. In one sense, I just kept writing the notes and ideas as they came to me and popped them into very general sections, I wrote a map to try and keep myself on track, I had character profiles, complete with pictures of the characters as I see them (e.g. Blackadder inspired one of the characters as did Spencer Tracey and Katherine Hepburn). As I got near to sitting down to write the first draft, I wrote a book outline, which broke the parts into chapters but when it came to writing, I kind of used the basic scaffolding but let the words flow instead and was surprised at how much more organic it became. As for my writing routine, I walked more when writing The Longbourn Letters and listened to classical music. For The Watsons, I created a playlist of modern songs that evoked the emotions I was looking for and it worked well. It really is a journey of growing and learning as a writer. I will probably have a totally different process for my next novel. My granny’s bookshelf held all the classic novels and I read Pride & Prejudice during my teenage years. That was such a formative time of hoping and yearning for me, so reading Pride & Prejudice, just then, seemed to sweep me up into all kinds of expectations and dreams for what life might hold and the idea of being free to pursue them. Pride & Prejudice but Persuasion is a close second. Aunt Jane would sit very quietly at work beside the fire in the Godmersham library, then suddenly burst out laughing, jump up, cross the room to a distant table with papers lying on it, write something down, returning presently and sitting down quietly to her work again. Mostly character-driven writing. I love the absurd and hilarious such as PG Wodehouse but any writing which focuses on characters (poignant, distressing, emotional, funny) all catch my interest; writers such as Nuala O’Connor, Donal Ryan, Kevin Barry, Liz Nugent, John B. Keane, Khaled Hosseini, Agatha Christie – all excel at this. I’ve come to realise that lots of my writing happens when I’m not writing – like when I’m half-dozing off to sleep or on waking up, when I’m walking or washing the dishes. So one of my writing rituals is to have a pen nearby and catch the ideas (often on the back of my hand or on a post-it) to be typed up later. Tea is an essential part of my writing ritual. Excellent interview — great questions, too. Do the young’ uns know that when Austen’s niece is talking about her “work” she means sewing. Aunt Jane is sewing and thinking about her novel. Lovely picture. It is a wonderful picture. I have to admit this oldie didn’t know either, though I’m going to use my gender as an excuse for my ignorance. I was fortunate to win the paperback of Rose’s book in a giveaway. I must say, I absolutely loved it! I am excited to hear that she is working on her next book. I enjoyed the interview Mark and look forward to reading your book in the near future! Thanks, Carole. I’m looking forward to Rose’s next book, too!